What does Paul when he says no one has the right to condemn you for sabbaths? We must recognize the important thing. Jewish unleavened bread called holidays, holidays Trumpets, Atonement holidays and other holidays that have been prefigured the coming of the Messiah on Saturday! Colossians 2, 13 - 17 - Yes, even you, dead in sins and the uncircumcision of your body along with him come to life forgive us all the guilt and erase the enemy promissory note, the rules are against us. Forever it aside when it nailed to the cross! In it disarmed the powers and governments, is publicly revealed and celebrated the victory over them! Do not therefore condemn anyone for eating or drinking, due to holidays, new moons or sabbaths. Those things are a shadow of what was to come, but the essence is in Christ. In other words, Jesus Christ, to repay our debt. We paid the promissory note, in this way we are exempt from the above law, which we transgressed. The sacrificial system of the Old Testament Passover with the victims was a visible representation of the promissory note - the path through the sanctuary is covered with blood. But Paul says "Christ came in the sacrificial system of its fulfillment. 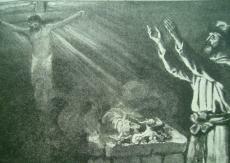 All pointing to the sacrifice of the coming of Christ passed. Paul points out: "That's just a shadow of things to come ...". There are two laws. The Bible says that God gave the law - the Ten Commandments, which was written by the finger of God on tablets of stone, and entered into the ark of the covenant. Here is Saturday as a memorial of creation. It is a constant reminder of the truth of creation. It reminds us that we not arise by evolution, but that God created us and deserve our respect. A second, ceremonial law of Moses, which was placed beside the ark of the covenant. It is a ceremonial law, which includes holidays and ceremonial Jesus' death Saturday was canceled. It was a precedent for the coming of the Messiah. But God's Ten Commandments and insists he will be judged according to! Exodus 31.18 - When the Lord said to Moses on Mount Sinai, he finished, he gave him two tablets of testimony - stone, written with the finger of God. Deuteronomy 4,13,14 - He declared to you his covenant, which he commanded you to perform, namely the Ten Commandments, which he wrote on two stone slabs. At the time my Lord commanded me to teach you these rules and laws to comply with them in the country that are going to occupy. 2nd Ceremonial law of Moses, which was placed beside the Ark of the Covenant. Deuteronomy 31, 24-26 - When Moses wrote the words of this law from beginning to end, he commanded the Levites who wear the ark of the covenant: 'Take this book of the law and place it next to the ark of the covenant of the LORD our God, let there be a witness against you . Ezekiel 45, 16-18 - all the people of this country will benefit the victim to hand rulers. The ruler will then deliver the flour offering sacrifices and libations on holidays, new moons, even on Saturdays and all the festivities of the house of Israel. These verses show that blood and other sacrifices, new moon celebrations, holidays, and Saturdays are part of the ceremonial sacrificial act, pointing to the Messiah. It is therefore another on Saturday, about which the Bible speaks. In Leviticus is a reference to two types Saturdays. Throughout the chapter, Moses explains the holidays and the Holy Assembly, which the Israelis maintain. In the 3 verse, God reminds Moses the seventh day, Saturday, Ten. It should be every week, a day holy gathering. Jewish agricultural calendar was divided into two periods - spring and fall. Therefore, the Jews had spring and autumn festivals holidays. Spring holidays God has to point to the first coming of Jesus. Autumn holidays pointed forward to the events after Jesus' first coming on his second coming. It is important that in the 23rd Leviticus chapter about these holidays are referred to as "Saturday". Leviticus 23, 32 - (talking about the holiday - the Day of Atonement) will be Saturday for you all Saturdays. From evening on the ninth day of that month to the next party will maintain fast and Sabbath. " Because the holiday is celebrated blowing the first day of the seventh month and the day of Atonement on the tenth day of the seventh month, could be both days at the same time on the seventh day of the week, Saturday, according to the Ten Commandments. Leviticus 23,37-38 - This is the feast that you will declare a holy assembly. When you bring them to the LORD offerings by fire - the burnt offering and floury, offering peace and drink offerings, each of them in the day. All except the Lord on Saturday (seventh day), and excluding all your gifts, pledges and voluntary sacrifices, which will bring the Lord. The Israelites were to keep the holidays, or in addition to the provisions of the seventh day, Saturday the Lord. Holidays pointed to the coming Messiah. When Jesus came to be fulfilled, and may not be further observed. It is certain that the Apostle Paul did not attempt to remove the seventh day - Saturday the law of God, the Ten Commandments, but the holidays and the Sabbath as a prototype for the Messiah. Recall the important biblical principle. When studying the Bible we see to it that what is clearly explained what is unclear. We should not ignore the hundreds of clear text to a particular topic just because one or two explanations is difficult. AmazingHope.net - What does Paul when he says no one has the right to condemn you for sabbaths?